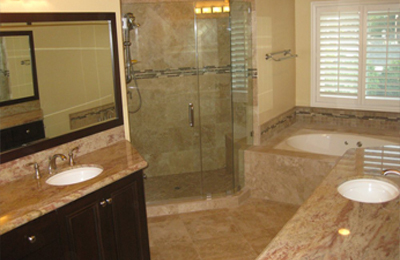 When you’re looking for home improvement experts, My Space Remodel is your best choice in renovation contractors serving La Verne, California. We specialize in room additions (including second story additions), kitchen remodeling (including new layouts), and bathroom remodeling (including complete suites). Our skilled craftsmen and experienced managers are also ready for patio enclosures and sun rooms along with other backyard home improvements such as decks and gazebos, patio covers, and outdoor kitchens. If you’ve decided that it’s better to renovate where you are than move, you have lots of company. To give you a few numbers, http://www.trulia.com/real_estate/La_Verne-California/ and http://www.realtor.com/local/La-Verne_CA put median selling prices for single-family homes in La Verne at $580,000 to $600,000 (June, 2016). Individual home values vary widely, but cluster at around $350 per square foot. That happens to be roughly the cost of many luxury kitchen or master suite add ons — simple add-ons can be as little as half that. My Space is experienced in all sorts of room additions, and thoroughly familiar with La Verne building codes. We’re specialists in second story additions, solving any structural issues efficiently and affordably. So when you need more space, zoning permitting, you can grow upwards to preserve backyard space. So what sort of extra space do you need? 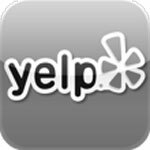 We’re experienced in bedrooms, baths, home offices, playrooms, and home theater rooms. Even master bed/bath suites and mother-in-law apartments are no problem for us. Whatever you need our experts in framing and finishes, hardwood floors, tile, roofing, stucco, plumbing, electrical work and more have you covered. A sun room or patio enclosure is a great way to economically add more indoor living space. 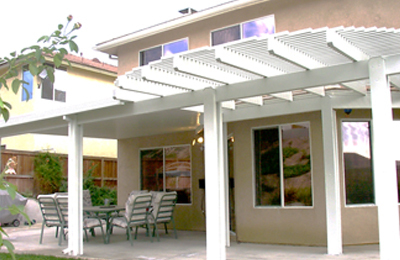 And our decks and gazebos, outdoor kitchens, and patio covers for shade blur the lines between indoor and outdoor room additions — perfect for La Verne’s climate. 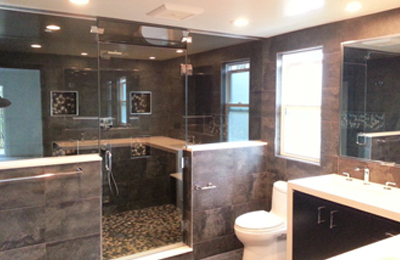 Our design and construction expertise can also complete a custom bathroom remodel that fits your tastes and budget precisely. Are you looking for a relaxing retreat or a morning mood boost to start your day? Or both? 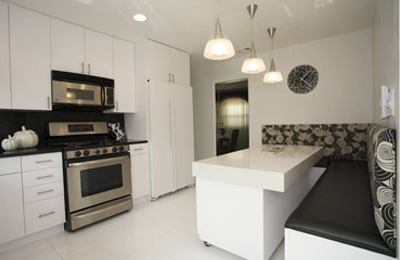 Prefer being surrounded by total glamor, modern elegance, or a cozy cottage feel? Need more cabinets? Just let us know and our experts will guide you through today’s amazing range of choices in style, materials, color palettes, and features. Don’t put up with drab any longer! Instead, step into your own private spa. Whether your dream kitchen is cozy, comfortable, and convenient… a modern gleaming stainless-steel chef’s palace… traditional Tuscan style… or just about anything, we can make it happen with a kitchen remodel. 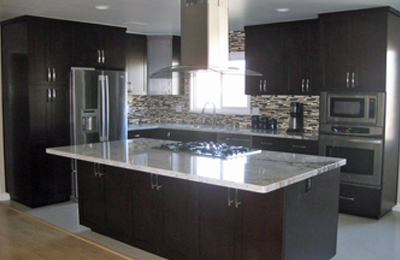 We can include everything you might want for your La Verne home, top to bottom: recessed lighting, stand-out kitchen cabinets, tile back splashes, granite or marble counter tops, just about any style sink, built-in appliances, and premium flooring. You can keep your current floor plan, add an island, or go for a completely different layout. Worried about those home improvement horror stories? 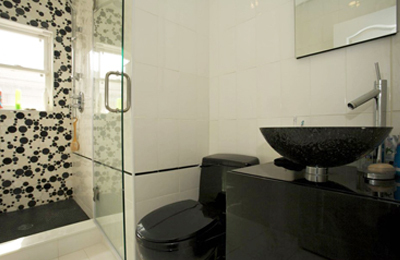 There’s no need for concern if you take the time to carefully choose a contractor. You can find detailed guidelines and action steps on the web. Here are a few highlight tips from http://www.hgtv.com/design/decorating/clean-and-organize/how-to-choose-a-remodeling-contractor. Check credentials! Confirm that they indeed have all the appropriate licenses and certifications for La Verne, Los Angeles County, and California. Membership in national associations is a good indicator of their professionalism. Talk with them beyond the minimum necessary to get an estimate. Do you feel they’re answering your questions properly? Are they asking you good questions? Don’t glaze over when it comes time to sign the contract. Actually read it; everything must be there in writing and clearly spelled out. And if there’s something you don’t understand get your questions answered by someone you trust. Any company you choose should be responsible for the entire project, including permits and passing inspections. The California Building Standards sets specific requirements for nearly every building modification, and the City of La Verne has its own permitting, plan submission, and inspection processes… and of course fees. Things can get extremely complicated, especially for kitchen remodels and bathroom remodels, so permits are best left to licensed professionals.